PHP is a server-side scripting language particularly well-suited for web development but also popular in general-purpose programming. Originally created by Rasmus Lerdorf in 1994, new versions are now produced by The PHP Group. mod_PHP—The default on vanilla Apache HTTP servers. PHP is run as an Apache module, meaning that a PHP request is run under the Apache process. This makes PHP perform well, but flexibility is limited by the Apache configuration, permissions, restrictions, etc. PHP_FPM—FastCGI Process Manager (FPM) uses pool management to optimize performance. Every pool acts as a standalone PHP instance, enabling you to create an independent configuration per pool, which provides granular control and greater flexibility. This is the fastest-performing method to run PHP. See Which environments and versions does Dynatrace support? for details on supported technologies used in conjunction with PHP. Beta Starting with OneAgent version 1.155, you can monitor PHP on your Windows (IIS/Apache) environments—full-stack monitoring is now available on Windows for Apache mod_php applications and PHP CGI. To enable PHP monitoring on Windows, go to Settings > Monitoring > Monitored technologies and toggle the PHP for Windows (Beta) switch to the On position. The different PHP versions have support timelines defined by PHP. Please refer to Supported PHP versions at php.net to see which versions are currently supported by PHP and when end of support for each version is planned. Deprecated versions don&apos;t receive updates or security patches, so running them in production should be avoided. Dynatrace is committed to supporting each PHP version for at least as long as the vendor supports it (in most cases, support extends for at least six months beyond this point). We also write the message to the error logs on the host machine. To enable PHP 7.3 monitoring in Dynatrace, go to Settings > Monitoring > Monitored technologies and toggle the PHP 7.3 (Beta) switch to the On position. CLI monitoring is turned off by default, because, during a short-lived CLI execution, injection overhead may make up a large percentage of the whole runtime. You should refrain from using CLI monitoring when threading and forking is used for the monitored application, as these features aren&apos;t supported. CGI monitoring for Windows has been in Beta since OneAgent version 1.155. At this point, there is no differentiation between CGI and Fast-CGI; these are reported as a single type: CGI. 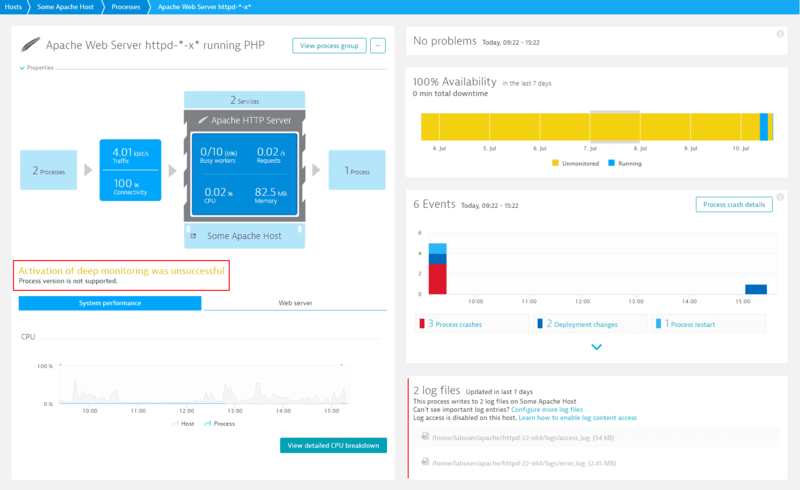 Dynatrace Open Q&A: What is the desupport policy for PHP? Blog: New response time analysis views!